Weekly report summarizes everything that happened in your company for the past week. It will arrive to your email inbox every week. Weekly reports is a feature that will help you on top of your game and have a better overview of everything that was going on in Productive for the past week. You’ll see what was the project that people worked most on, how many tasks were created, what is ready for invoicing, how many new deals you had, how many deals you won and lost, how much money your clients owe you and more. 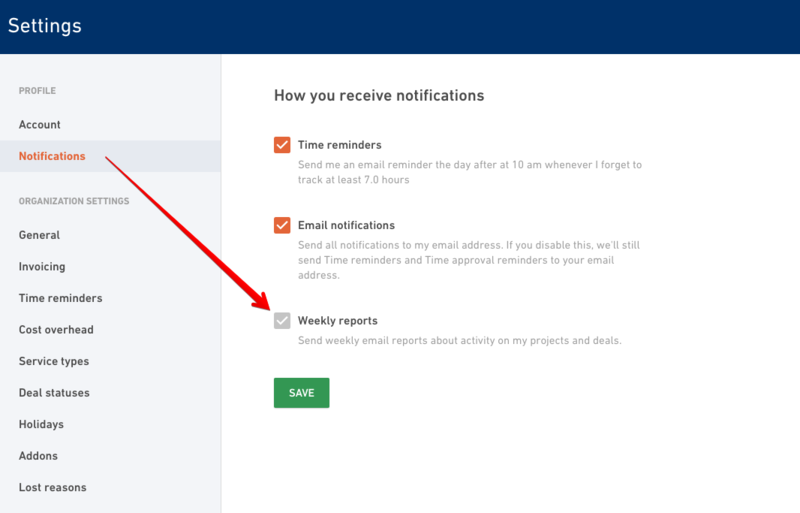 You can turn weekly reports on (or off) in the Settings. Click on your profile (top right corner) > Settings > Notifications.